Daiwa 60th Anniversary Tatula 100XS - RH 8.1:1 [Daiwa Tatula 100XS 60th] - $149.99 : The Tackle Trap, Inc., It's all about fishing tackle! In stock and ready to ship! 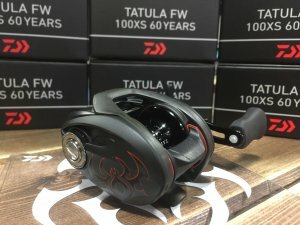 This limited edition 60th Anniversary Daiwa Tatula is absolutely beautiful! These will not last long, neither will the matching 7'3" Medium Heavy 60th Anniversary Tatula casting rod also available on our site while supplies last.